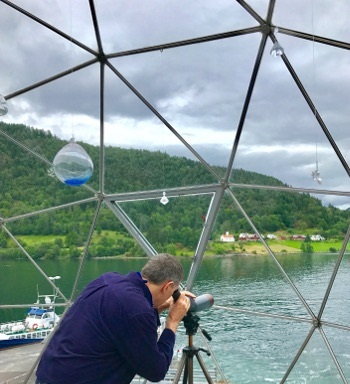 In 2008, Bjørg Bjøberg and Arthur Adamson bought a Solardome® Haven to sit on top of The Golden House, an art gallery in Balestrand, Norway. It has wowed visitors ever since. We caught up with Bjørg who, in her own words, takes us on a journey through The Golden House and describes the unique experience that can be felt in a geodesic dome. “Our house is a gallery, from the ground floor to the rooftop, which is the fourth level of the house. The roof is where you can find our wonderful Crystal Dome. 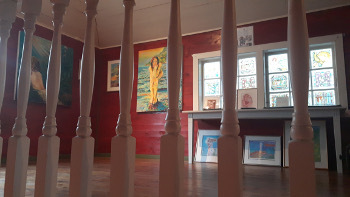 Bjørg’s gallery and art store fill three rooms on the ground floor, and is next to Arthur’s gallery through a linking door. The original staircase leads up to a fascinating village museum, which is Arthur’s showpiece gallery, known as ‘Golden Memories’ – a collection of old artefacts from the village of Balestrand and Bjørg’s family archive. Finally, a narrow, ladder-like staircase, leads visitors up onto the roof and into the Crystal Dome. “When I guide our visitors through the house, I often refer to the the song ‘Stairway to Heaven’. One has to take the tour to fully appreciate the wonderful effect of rainbow light that bounces all around you as you enter the geodesic dome. Once up there, you feel you are on the top of the world, and you want to stay there. The view is simply stunning. In fact, it is the only place in the village where you are able to view all the famous mountain tops that surround Balestrand. On a clear sunny day it is quite breathtaking. We have decorated the room with big glass beads and crystals. When light hits the surface of these bulbs, it reflects the spectrum colours. This represents the colours of our paintings. 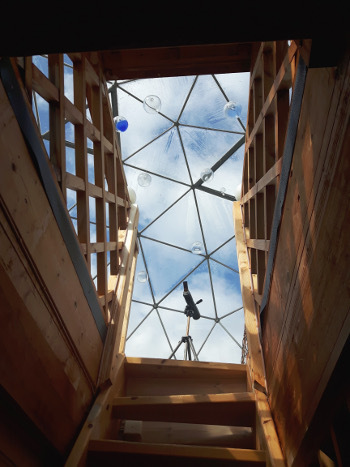 For Arthur and I, the Solardome® glasshouse, our Crystal Dome, is a symbol of the magical light and colours of the open room that has made Balestrand famous. We look forward to next summer when we will be offering daily tours of the house. It’s a unique experience of the history, culture and art that Norway has to offer. Read more: The Golden House case study.